Harness leather draw reins, pulley type with snaps. Pulley draw reins made with 1 piece of leather with brass snaps for easy removal. Leather pulleys snap on to the bit and allow the rein to slip freely. Didn't see a marking, but quality similar to Weaver. Cotton web draw reins with loop ends for girth, billets or tie straps slips through, & buckle center. Can be used English or Western. Approx 7 1/2' long. Previous owners name written in marker on one rein end. Harness leather draw reins, pulley type with snaps. Pulley draw reins made with 1 piece of leather with brass snaps for easy removal. Leather pulleys snap on to the bit and allow the rein to slip freely. Didn't see a marking, but quality similar to Tory, Weaver, etc. 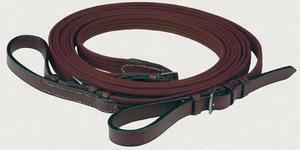 3 /8” Harness leather draw reins with snaps almost 7' long. Some chew marks on leather in spots, but does not weaken leather nor interfere with use. Snaps all work well. Someone's name written on underside near bottom. 3/4” quality cotton web draw reins with leather loop ends(girth, billets or tie straps slips through) & buckle center. Can be used English or Western. Approx 8 1/2' long. 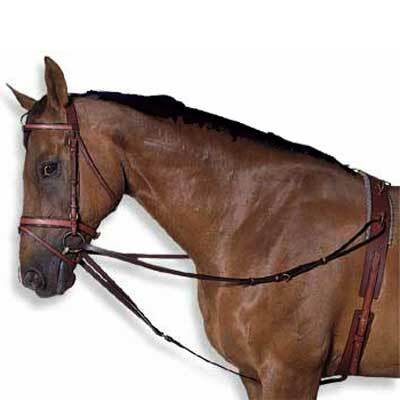 3/4” quality cotton web front draw reins with leather in the hand hold area & buckle center. Web loop ends for the girth, billets or tie straps to slip through. Leather is quality with scored, rubbed & darkened edges. Can be used English or Western. Almost 9' long on each side. Brand unknown. Pulley draw reins made with 1 piece of leather with brass snaps for easy removal. Leather pulleys snap on to the bit and allow the rein to slip freely. Draw reins made with one piece of leather with brass snaps for easy removal. Snaps on to the bit and the girth. Not tagged, brand unknown. 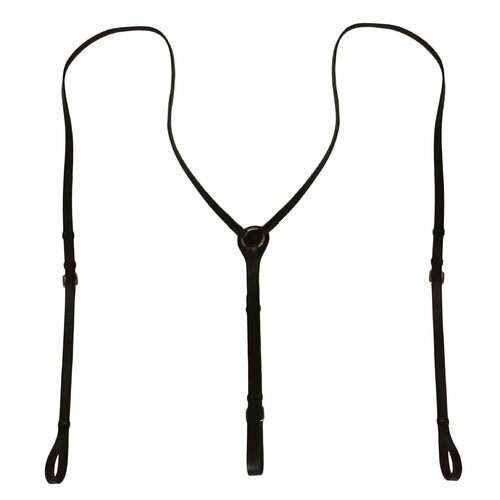 Draw reins made with one piece of split harness leather with brass snaps for easy removal. Snaps on to the bit and the girth. 1” heavyweight cotton web draw reins with snap ends for fastening to saddle or girth rings, sliding bit snaps & buckle center. Can be used English or Western. Approx 7 1/2' long. 3/4” quality web draw reins with loop ends(girth, billets or tie straps slips through) & buckle center. Can be used English or Western. Approx 7' long. Shorter length great for pony, cob, or small horse sizes. 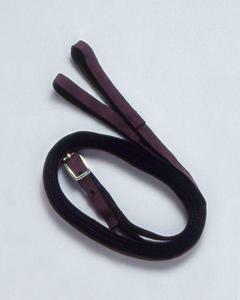 5/8” good quality leather draw reins with swivel snaps on ends, buckle in center, a little over 7' long including snaps. Can be used English or Western. One rein is slightly shorter than other with snap riveted on, other end has trigger snap & Chicago screw, which makes the buckle slightly off center. Some kinks in leather where reins were tied together. Still great training reins with leather in good condition. Brand unknown. 3/8” harness leather draw reins with brass snaps, almost 7' long. Snaps all work well. Brand unknown but quality similar to Weaver, Tory, etc. 3/8” harness leather draw reins with snaps. Pulley draw reins made with 1 piece of leather with swivel snaps for easy removal. Leather pulleys snap on to the bit with trigger or scissor snaps & allow the rein to slip freely. Some corrosion on snaps, but all still work well. Chewed area in a couple of spots, tugged on these to make sure ok, 1 may need to be cut out & stitched. Selling these AS IS. 3/4” quality cotton web draw reins with adjustable buckle closure leather loop ends(girth, billets or tie straps slips through) & buckle center. Like new, couple of small surface marks on center buckle leather area from cricket chews(we get crickets here that eat the surface of leather looking for salt). Can be used English or Western. Approx 8 1/2' long. Add snaps to make easy on/off. 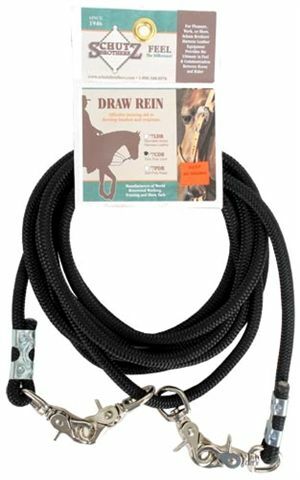 Approx 7/16” wide slightly firm poly cord draw reins, 15' long with scissor or trigger snaps on ends. Snaps slide freely on cord for a pulley action. New, Schutz tag missing. 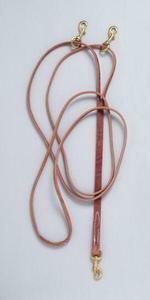 3/4” good quality leather draw reins with buckle in center, & loops on ends, approx 7 1/2' long. Can be used English or Western. Stamped Made in England, so possibly Crump, Crosby, etc. Leather needs a dose of conditioner but is not cracking & is flexible. 3/4” quality cotton web draw reins with adjustable buckle closure leather loop ends(girth, billets or tie straps slips through) & buckle center. Can be used English or Western. Approx 9' long. Add snaps to make easy on/off. No brand or maker mark. The Vienna Lunge Reins are a training aide used extensively in Europe as an alternative to side reins. They are becoming more popular in the US. The reins attach to the rings of a surcingle through the bit, then to the girth. This will encourage the horse to round and release his back. Could be hooked to front dee rings on an English saddle. 3/4” wide leather with darkened edges. Brand unknown, leather supple & in excellent condition. Approx 3/8” wide slightly firm poly cord, 10' long with swivel bolt snaps on ends, & heat sealed ends. Cord slides through bit rings for a pulley action. Open ended loop allows this to be tied at desired length. Snap to girth center or side rings, or saddle D's. Light dirt, but no frays & snaps work well. Brand unknown. Approx 1/2” wide slightly firm poly cord, 16' long with swivel bolt snaps on ends & a set that slide. Snaps slide freely on cord for a pulley action. End snaps attach to girth center or side rings, or saddle D's, & sliding snaps attach to bit rings. Light dirt, but no frays & snaps work well. Brand unknown. Approx 1/2” wide soft poly cord approx 14' long with swivel trigger/scissor snaps on ends & a set that slide. Snaps slide freely on cord for a pulley action. End snaps attach to girth center or side rings, or saddle D's, & sliding snaps attach to bit rings. No frays & snaps work well. Brand unknown. Thick 3/4" wide harness leather reins with water loop ends, leather stoppers, & removable draw rein. 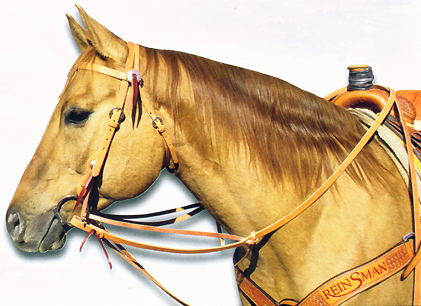 Reins are 4" over 5' & have a buckle center like English reins. Slit in reins below stopper allows for draw rein ends to be inserted. Works like a German Martingale or draw rein. Attach your reins as normal onto your bit. Slide the ends of the draw reins through the bit rings, back through the slit in the regular reins below leather stopper & tie. Snap bottom of draw reins to the girth dees. You can use the draw rein action just by using your regular reins so less bulk in your hands. This setup will promote athletic carriage by helping the horse round in the back while elevating at the wither & poll. Caution should be taken to not encourage flexion which allows the horse to tuck his nose behind the vertical. Reins are Reinsman #7302 & German Martingale is #7762. Hermann Oak leather. Reins are no longer available from Reinsman, so no stock photo available, stock photo shows German martingale alone & on the horse. 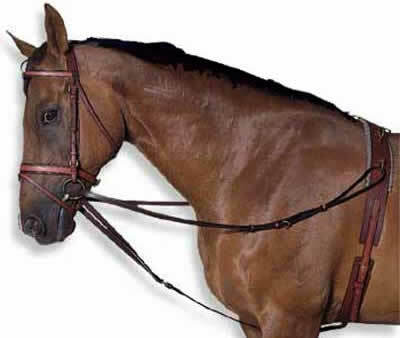 Leather reins are very sturdy yet supple, draw reins show some wear but are also supple & brass spring snap works well. Harness leather pulley draw reins made with 1 long piece of leather with brass swivel snaps for easy removal. Leather pulleys snap on to the bit with brass trigger/scissor snaps & allow the rein to slip freely, pulleys are removable. Didn't see a marking, but quality similar to Weaver or Tory. 3/8” harness leather draw reins with snaps. Pulley draw reins made with 1 piece of leather with swivel snaps for easy removal. Leather pulleys snap on to the bit with trigger or scissor snaps & allow the rein to slip freely. All brass hardware. Brand unknown, quality similar to Tory or Weaver. Leather sturdy yet supple, but cloudy finish. 2 available. Brass bolt snaps on ends, nickel trigger/scissor snaps on pulleys, very end of 1 pulley looks like it got chewed on, but doesn't interfere with use. Snaps were a little stiff or slow to close but loosened with use & should loosen further if sprayed with lubricant. Leather sturdy yet supple.